This is of course the set-up for Anthony Shaffer’s famous stage play "Sleuth," made into a movie in 1972, nominated for four Oscars, including Michael Caine and Laurence Olivier as Milo and Andrew. 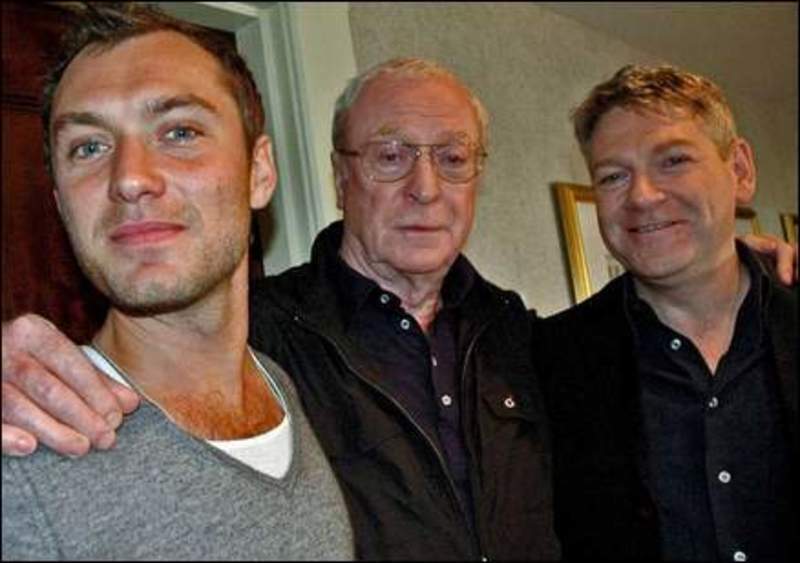 And it is also the set-up for a 2007 version, opening Friday, with Caine stepping up to the Wyke role and Jude Law as Milo. But do not make the mistake of calling the film a “remake.” The screenplay this time is by Harold Pinter, 77, the Nobel-winning playwright, and as with most of Pinter’s work, the point isn’t so much about what happens, as how the characters talk while something is about to happen. I talked with Caine, Law and the film’s director, Kenneth Branagh, at the Toronto Film Festival, where the film premiered last month. Good chaps all. Relaxed, kidding each other, pleased to have made an original Pinter. “I can’t compare them because I haven’t seen it since the first time I saw it and I didn’t revisit it,” Branagh said. “The movie told backwards, where they start in misery and end up in happiness,” I said. “’Betrayal,’ of course,” Branagh said. Caine: “With Ben Kingsley and Jeremy Irons and Patricia Hodge, directed by David Jones.” I had the impression he could have even told us the cameraman. “We’re not talking about a first-timer screenwriter here,” Branagh said. “One of the things I loved about Harold’s screenplay, and these two absolutely maximize it, is the question of when they are being genuine. Does Andrew really love his wife, or does he simply want to possess her? And at the end does even that disappear, and is it just about winning? The movie is really about performance, not plot, I said. It’s about whether they can fake out each other. Sir Michael, I asked Caine, were there any moments at all when you thought, this is what Sir Lawrence should have done the first time round? Caine laughed. “No, no. I haven’t seen the movie since. There was no backward reference to him. Larry did what should have been done for that moment. It was an entirely different way of life. When we opened that first picture, it was a lovely comfortable old English country house. This one, you get inside the country house, and it’s suddenly a nightmare. It’s brass, it’s steel, it’s marble, it’s glass. And minimal. “It’s a Pinter thing to play with you like that,” Law said. They talked on. It occurred to me that “Sleuth” is two men talking about a woman we never see, and our interview was three men talking about a playwright we never see.